Providing On and Off-Grid Generator Benefits; You choose how you want to use the system. We call it “GRID INTERACTIVE”. 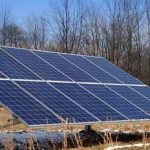 On/Off-Grid Generator Benefits – take a moment to read through the benefits available only to those who chose to have a portable, off-grid solar option for their home or business. Sol-Ark saves you money, gives you peace of mind and is backed by a great group of people who are here to help. Patent pending Grid interactive Inverter that reduces electric bills and designed to run Off-Grid for Years! Professionally engineered system that is easy enough to be installed by home owner or electrician. Lightning / Solar Flare / EMP Hardening while the system is in use! You don’t have to keep it in a bag or a cage-Use it to save money and be protected too. 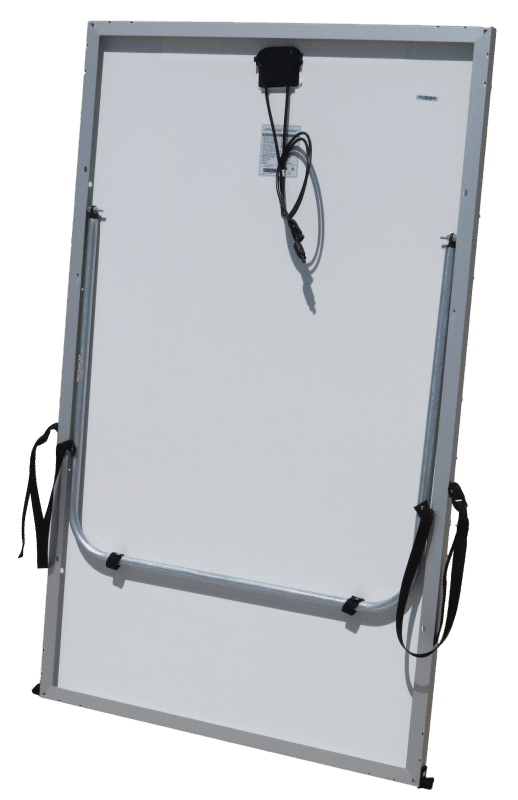 Hangs on wall and transportable in less than 15 minutes. Does not need a smart meter: does not require permits to install. 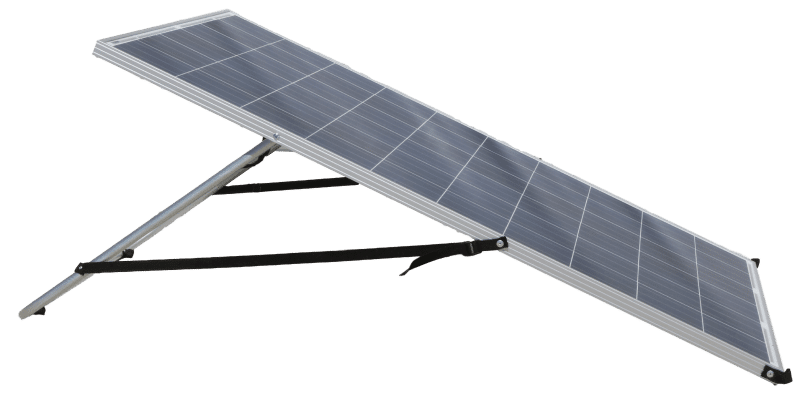 Scalable/Expandable: 4 to 16 batteries and 3 to 15 solar panels (280W each). Lightning / Solar Flare / EMP Hardening of Sol-Ark electronics will include EMP suppressors for solar panels and 3 appliances you plug directly in. Completely collapsible and stackable for portability. 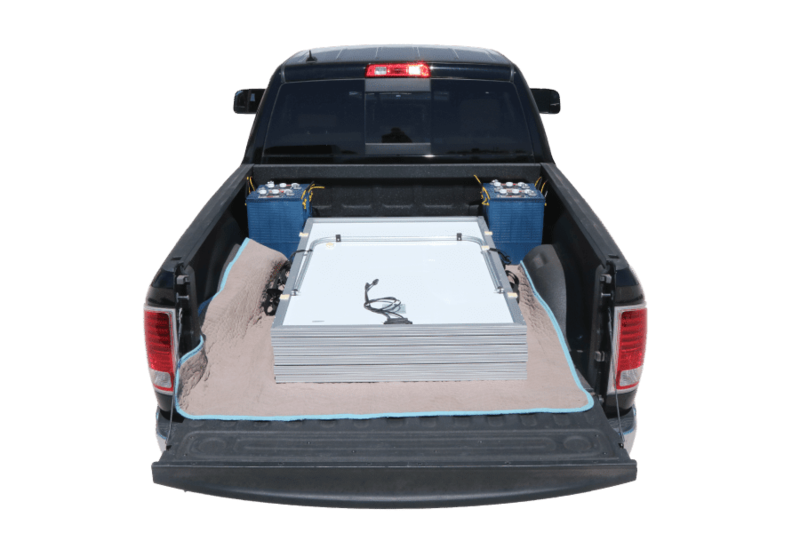 12 panels easily fit in a pickup truck. 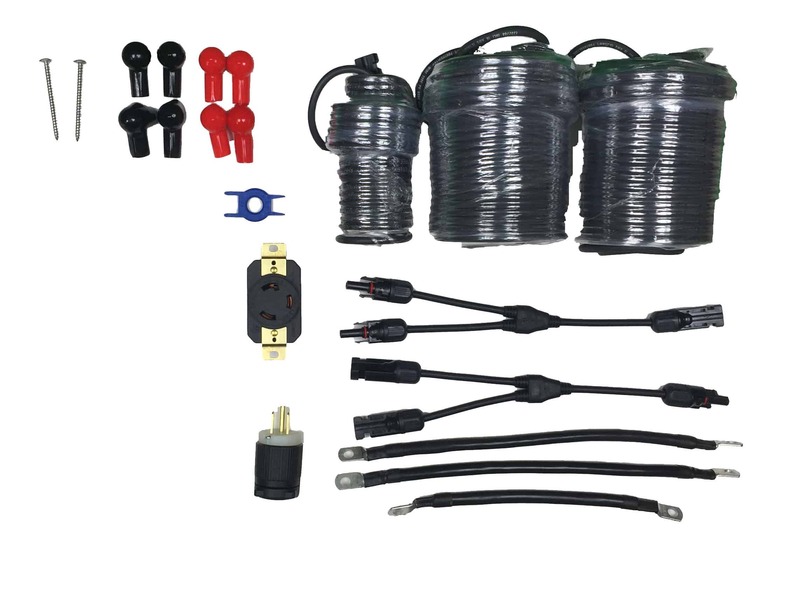 Allows you to quickly and easily connect into your home panel to distribute the solar generator power throughout your home wiring. Adjust your loads that stay on the generator all the time and only transfer high powered loads during a long term outage. 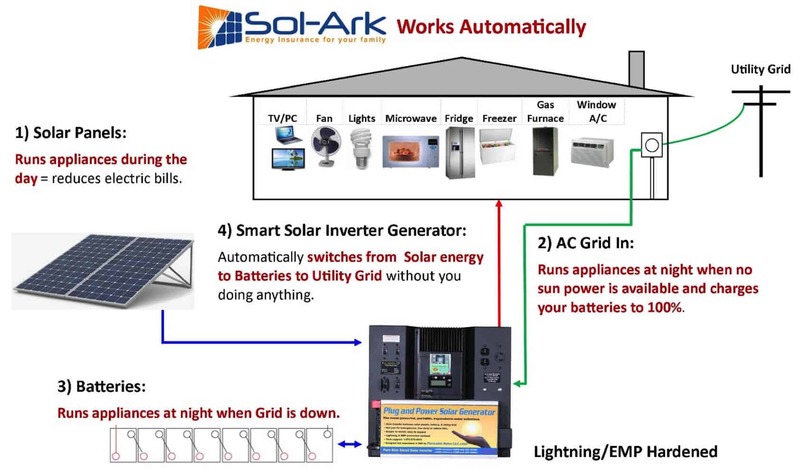 Remember Sol-Ark will automatically transfer between Grid and Solar several times a day, so you rarely do anything. Our proprietary solar configurator makes it easy to determine how many panels & batteries are recommended based on what you want to power. Why should I care about EMP or Solar Flare when it will never happen in my lifetime? The US, Russia, & China have EMP weapons as well as anyone that has access to a fission explosive. US States are considering purchasing EMP RF generators to allow law enforcement to disable vehicles remotely. Here at Portable Solar, we built our own EMP Generators for verifying protection levels and you can buy a suitcase sized EMP Generator for as little as $100K. In the case of Solar Flares, NASA estimates a 12% chance of a flare hitting earth in the next 10 years. Combine this with the additional chances of EMP resulting from foreign aggressors and the likelihood that you will experience some form of EMP/Solar flare are approaching half your chances of being in an automobile accident. The odds as so high that Maine & Virginia are hardening portions of their power Grid and 2 more states have passed legislation to begin the process. How does the Sol-Ark protect itself and the entire panel system while in use? —-We designed our own inverter, charge controller, and EMP suppression. The Sol-Ark protects itself and solar panels from EMP and as much as possible, the appliances plugged into it. What data exists showing EMP hardening effectiveness? —-We followed proven EMP military designs (with data) to design our systems to at least 50KV/m EMP. Because we have the expertise, we built our own EMP generators and high voltage equipment to verify our design. It took over 8 months.We have internal documents and data overseen by our electrical engineers, mechanical engineer and nuclear physicist. We have not had the opportunity for independent lab verification to RS-105 military specs because our favored test facility was completely bought up by the military for all 2016 and 2017.We plan to do as soon as time opens up. We tested this unit along with the Sol-Ark 8K at the NTS labs May 2018. EMP is very challenging to protect against. The simplest and cheapest solution is a Faraday cage, but you cannot use the system. To us, that is a waste of expensive hardware and lost opportunity to use solar. Military EMP designs can take an EMP in use. That is what we designed for. Contrary to popular belief, Solar Cells are not damaged by EMP. Military Solar systems (including panels) were tested by one of our engineers at White Sands N.M. EMP test facility. Solar Panels themselves have been verified at multiple test facilities. They also survive massive electromagnetic radiation in space. However, the diodes and solar cells are damaged by the attached solar wires. Why shouldn't I use a whole house suppressor? —-EMP travels through air and power lines. That is why 1 whole house suppressor installed at your electrical panel will not work. Does the Sol-Ark protect against all three types of pulses, like from solar flares and lightening too? —-Yes, The Sol-Ark employs a system level approach with many different technologies to handle the EMP E1, E2, E3 energy pulses. What additional equipment comes with the system to help with protecting my appliances? 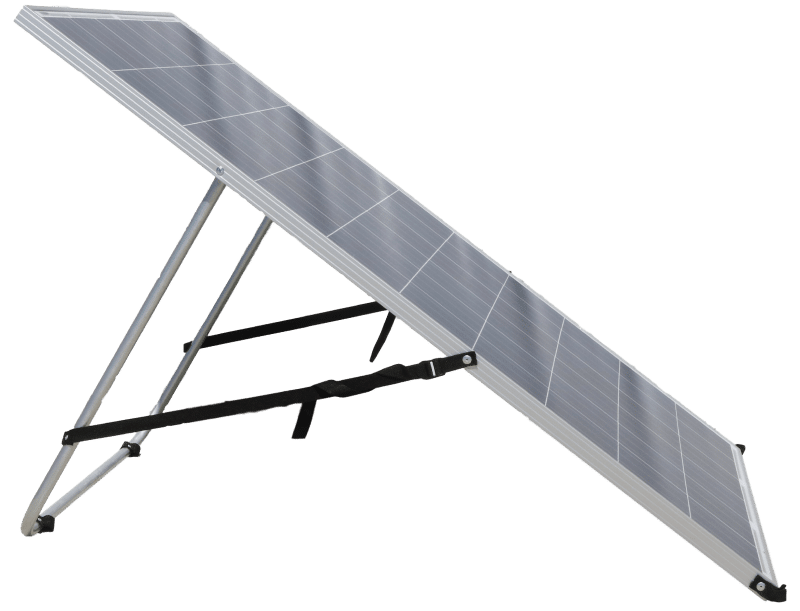 —-We provide EMP suppressors for the solar panels. (FYI, they are useless without the EMP suppression built into the Sol-Ark). The power lines in your home act like giant antennas for EMP. We provide EMP suppressors for the appliances around the home that get powered by the Sol-Ark. (Again, useless without the Sol-Ark). Aren’t Solar panels destroyed from EMP? Yes, but not way you think, the solar wires running from the panels to your home are the issue because of antennae effects. 50ft of wire can lead to over half a million volts being applied to the solar panels. This means that merely replacing solar electronics and solar panel bypass diodes is not going to save the panels. However, with proper protection, solar panels have been shown to survive testing in multiple EMP facilities. In fact, one of our nuclear engineers at Portable Solar has tested them himself. The military standard is 50KV/m hardening. So won’t a 100KV EMP weapon destroy everything? Not really. The amount of voltage applied to a circuit from an EMP is dependent on the length of the wire acting as an antenna in addition to the strength of the EMP. This means that a properly designed EMP suppression system that can handle a 50kV/m EMP with 200ft of wire attached to it stands a very good chance at surviving a 100kV/m EMP as well. In short, the length of wires and design are more important than the strength of the EMP. You can choose up to 150kv/m protection with the Sol-Ark 8K. Do I need a grounded faraday cage around everything? A simple faraday cage is the easiest solution, but not the only one. The military and leading civilian companies use multiple technologies to protect electronics while in use without the need for grounding such as VIP vehicles and Air Force One. How long will it take for you to build an EMP hardened system for me? —-We keep them in stock, but sometimes if we are sold out the customers need to understand that we only use the best quality EMP hardening technologies. Most of the EMP technologies we use are difficult to acquire with 12+ week lead times. So if you want an EMP hardened system, better to call sooner than later. 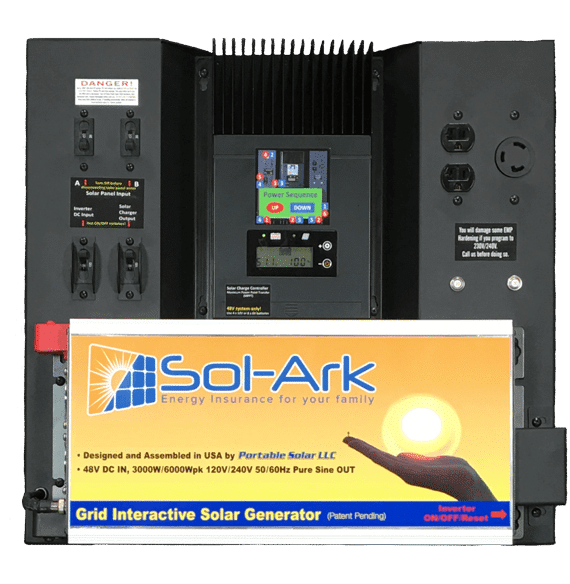 Is the Sol-Ark system 110/120V or 220/240V? The Sol-Ark can be programmed to run either 110/120v or 220/240v but is not a split phase. Contact our engineering department for options and solutions.YOu can get the Sol-Ark 8K that is a true split phase and cna do 110/240 at the same time.